BSNL broadband cancellation form needs to be submitted whenever a BSNL broadband customer wants to disconnect his service. 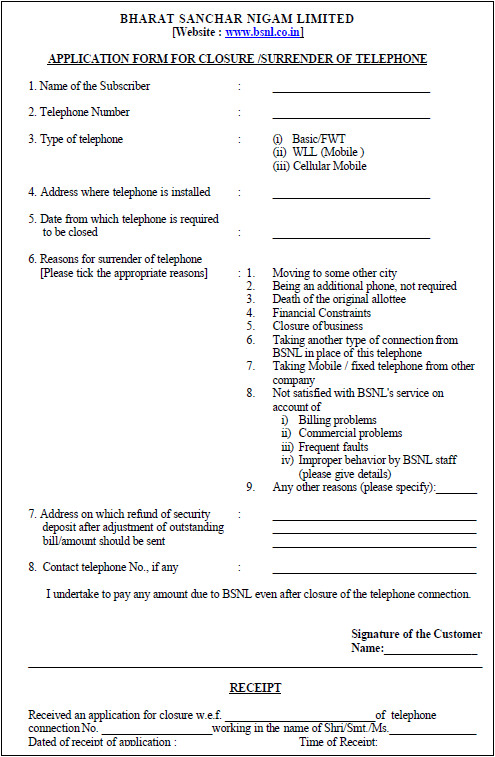 BSNL broadband cancellation form is also known as the Application form for closure or surrender of the telephone. Every BSNL broadband customer who wants to disconnect their connection must submit this surrender form to their respective BSNL branch office. You can download BSNL broadband cancellation form online by clicking on the below link. Once you download BSNL broadband cancellation form online then we need to fill this form with all the required information like name of the subscriber, telephone number, type of telephone, address where the broadband connection was installed, date form which broadband connection has to be disconnected and tick the reason for disconnection of broadband connection, etc. Along with this BSNL broadband closure form we need to submit a request letter for BSNL broadband disconnection and submit the latest paid bill copies. After submission of this broadband cancellation form of BSNL to the concerned BSNL branch office, we need to get an acknowledgment slip form them.